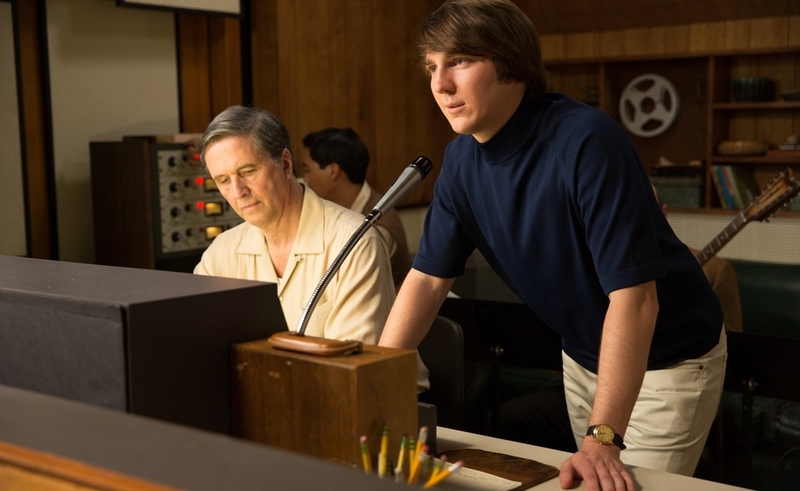 The Beach Boys’ music has its roots in the weaving together of multiple voices, so it makes sense for a biopic of Brian Wilson, the group’s brilliant songwriter-singer-producer, to attempt a similar effect. Love & Mercy alternates between two chapters of Wilson’s life. In one, in which he’s played by Paul Dano, Wilson stops touring with the group at the height of its popularity in 1964 after experiencing a nervous breakdown on a flight. Deciding his talents would be better expressed in the studio, he begins making music of stunning ambition. In the other, set in the 1980s, Wilson is played by John Cusack. He’s become a fragile, semi-reclusive figure surrounded at all times by the employees of Eugene Landy (Paul Giamatti), his live-in psychiatrist. Nonetheless, he reaches out and attempts to romance Melinda Ledbetter (Elizabeth Banks), a model turned Cadillac-seller. The contrast between the two leads should spoil the effect. Dano looks uncannily like Wilson in the mid-’60s, and his performance channels the charisma, and underlying fragility, Wilson had at his creative peak. Cusack looks nothing like Wilson, and given his long career playing the sharpest, most articulate guy in any room, it may take viewers a moment to adjust to the sight of him playing a broken man struggling to express himself. Yet an earnest attempt to convey the essential truth of Wilson’s extraordinary career and difficult life animates both halves of the film, and both performances. Abused as a child, misunderstood as a professional, and kept a virtual prisoner as a middle-aged man, Wilson’s story is one of genius struggling against exploitation, and not always winning. Director Bill Pohlad has only one previous feature to his credit—the 1990 film Old Explorers—but has spent the intervening years as a producer on projects including Brokeback Mountain, 12 Years A Slave, and Wild. Working with veteran Wes Anderson cinematographer Robert Yeoman, he brings considerable assurance to the film. In one scene, he stages the younger Wilson performing “God Only Knows” solo at the piano, the camera slowly swirling around him as the song builds in intensity—only to reveal Wilson’s disapproving father Murry (Bill Camp) sitting behind him in the final moments. To illustrate the full depths of the older Wilson’s dependence on Landy, Pohlad stages an increasingly uncomfortable scene in which a hungry, heavily drugged Wilson is reduced to an infantile state as Landy refuses to serve him food while a horrified Melinda looks on. It’s as if life handed him extraordinary gifts, only to demand an equally extraordinary toll. Pohlad doesn’t always sidestep the usual problems of musical biopics. A lot of exposition gets shoved into dialogue—as when a band member tells a room full of people who would already know that Pet Sounds didn’t sell that well in America, but did well in England—and both Murry Wilson and Landy are portrayed as villains with no redeeming qualities. Giamatti’s performance is unexpectedly unshaded, which might be true to the real Landy—a shameless self-promoter with no sense of boundaries—but it still occasionally tips the film into melodrama. But the film also gets a lot right, particularly in the long stretches dedicated to the recording of Pet Sounds and Smile. These capture both the intricacy of music so groundbreaking it could throw the conservatory-trained pros of the Wrecking Crew for a loop, and the joy Wilson takes in recording it. Dano bounces from the pleasure of hearing the sounds that had previously been confined to his head make their way into the world, and for a moment, every other worry falls away. Cusack and Banks are similarly convincing in the film’s 1980s stretch. Banks digs into what could have a thankless girlfriend role, conveying both what she finds intriguing about the strange man whom she meets while selling a car—and who hands her a card with the words “lonely, scared, frightened” written on it—how that intrigue could turn into attraction, and how Landy’s attempts to keep them apart could just deepen that attraction. Cusack rarely lets himself be this vulnerable, and they bring a tenderness to their scenes together. It’s an unlikely romance, but they make it make sense. If they didn’t, Love & Mercy wouldn’t work nearly as well. The 1960s segments establish why Wilson matters, while chronicling his disintegration as he attempts to turn Smile into a “teenage symphony to God.” It’s a tragedy driven by Dano’s strong work as a cracking wunderkind, and though it’s extremely well-executed, there’s nothing unexpected in it. The 1980s segments turn Love & Mercy into a different sort of film, one determined to break free from the standard rise-and-fall-last-minute-redemption arc of films like Walk The Line. With other people’s help, Wilson has to find ways to live with himself and push back the demons during the long coda following his glory years, years biopics usually treat as postscript. To its benefit, the film doesn’t try too hard to make connections between the two periods. It just lets each play out, and it rises on the harmonies created by the two chapters from the life of a man who’s seemingly destined to create more joy than he can ever hope to experience.